I really can't believe I didn't blog on November 13. TEN YEARS of blogging every day of November... I sat a lot at my desk that day too, so it wasn't lack of opportunity. I just never opened the window, and I hadn't written it down on my Bullet Journal, which is still a ragtag effort. After the X-ray we're finally called back and the PA tells us that the bone has shifted so we need to see a doctor today. Our care is being transferred to the pediatric orthopedic clinic (frankly it probably should have been transferred there in the first place, although the adult orthopedic doctor was great in the ER he's a doctor for adults, and a foot/ankle specialist at that). So I'm panicking as we go downstairs, because the doctor told us before if her bone shifts we'd need to reset it, and to do that it's another sedation procedure, which we surely don't want. And then I start thinking what if it's SURGERY and needs to have a pin put in so that it will stay in place while it heals? And will a pin have to stay in forever? What will that mean for future air travel. She's SIX! And spinning out of control, crying a bit while waiting with her in the kid-friendly waiting room. A half hour later, called back to the exam room. I'm not so nice to the receptionist when she asks me to fill out a form when we'd been waiting for a while already. Then we wait another ~20 minutes, at least, before the doctor comes in. He says it's no big deal, she's healing great and adult doctors are overly cautious with kids. He said it's within the range of normal and that the X-rays were taken at slightly different angles so it's not actually as bad as the PA read it. 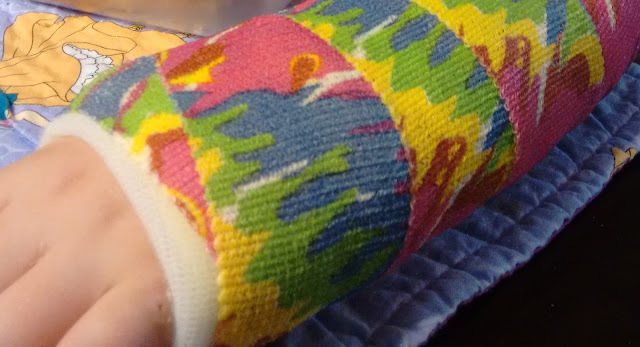 He offers a new cast if Jane wants one that's smaller and more comfortable, even though she'll only need to wear this one for another week. (!!! As I was thinking we'd be casted for a full eight weeks, and this would put us at about 4 total.) She wanted, so we did, and I ponied up the $25 for waterproof, even though keeping the bigger, thicker one dry wasn't so bad, the ability to wash her hands regularly is a big selling point. Plus we're going to keep it on until after Thanksgiving, so it's really nearly 2 weeks of value. Happy Birthday to me. A tie dyed cast (looks more camo on the roll) -- and you can see an ant bite still healing on her pinkie.